C&C JAPAN INTERNAIONAL Co., Ltd. was formed in 2004, and was the first Japanese used car export company to export to Dubai in the United Arab Emirates. Since then we have expanded into other global import and export markets, in Mongolia, Myanmar, Sri Lanka, Singapore, Australia, Tanzania, Mauritius and Thailand(Construction equipment). Our business concept is not to only follow normal Japanese business practices, but instead to push ourselves, and Japan, to excel even against global standards. Corresponding swiftly and accurately is essential in achieving this, and our company name is intended to evoke this blend of 'Japanese' and 'international' ethics. With the support and cooperation of all of our global customers, we are planning stronger development in many existing markets such as Africa, and also future expansion into the left-hand drive car market. C AND C JAPAN INTERNATIONAL Co.,Ltd. In what will surely be beneficial to Japanese used car related businesses in the area, the Dubai govenrment of the United Arab Emirates is to be open up the used car market as a free trade zone from next year. Dubai is to be a relay and sales point for Japanese-made used vehicles, with the goverment setting up new markets (temporarily called the "Japan Used Car Village") and encouraging approved businesses to get involved. A government-imposed limit of 49% foreign capital is to be waived for businesses involved in the venture. Currently 20 companies are applying for the initiative, with approximately 10 of those expected to be given official approval. Mohammed Al Abbar, government representative for trade and economics for the Asia Pacific region, said that the goverment expects great financial investment from Japanese companies. 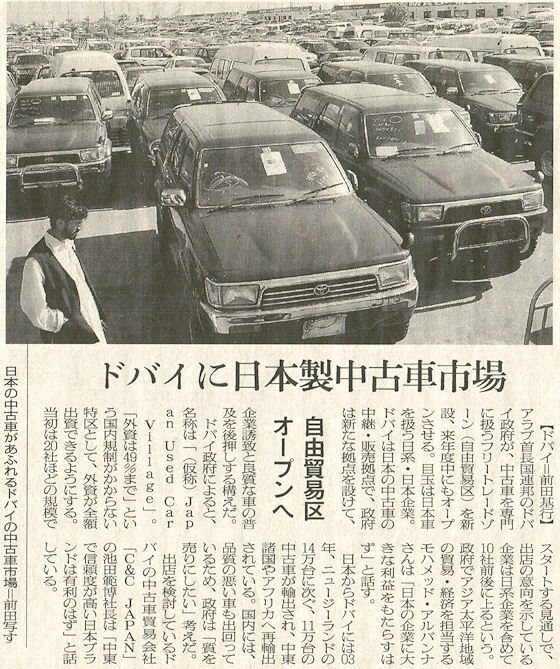 In 2003 Japan ranked just behind New Zealand's 140,000 total of vehicles exported to Dubai, with 110,000 used vehicles. Used vehicle exports to the Middle East and Africa have also experienced a surge in demand in recent years. With the large number of low quality used cars circulating domestically, the Japanese government has been encouraging the export of 'Japanese quality'. Norihiro Ikeda, president of C&C JAPAN, one of the companies considering trading in the Dubai used car market, told us that Japan's reputation for trustworthiness should be very favourable for companies working in the Middle East.